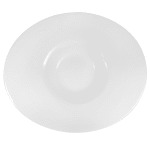 The Syracuse China 905356932 bowl has a 7-ounce capacity and an extra-wide rim, which offers plenty of room for handling it when the contents may be hot or filled to the brim. An oval bowl from the Slenda pattern, it features a light and thin ceramic body, designed to provide users with easier handling and give your restaurant a long-lasting service piece. The Royal Rideau color is an elegant and attractive shade of white, making this bowl a versatile addition to nearly any tabletop scheme or presentation.